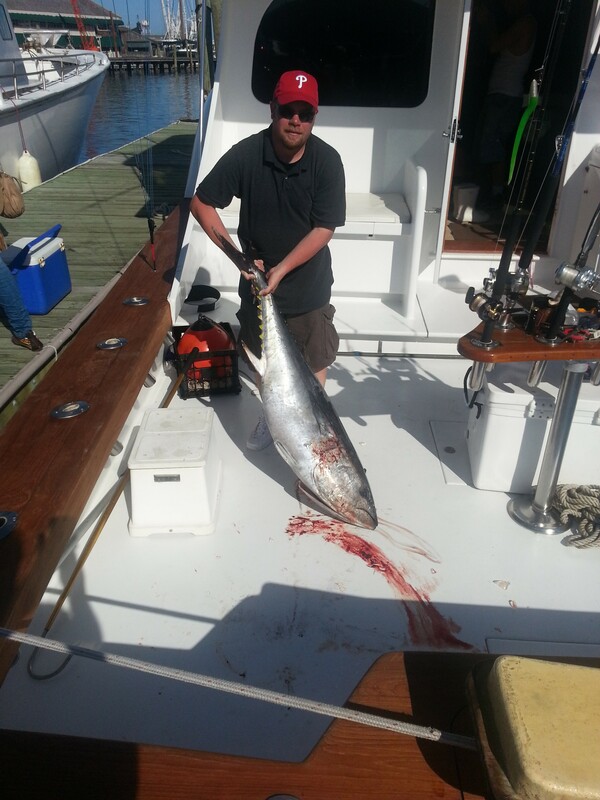 On Saturday’s open boat trip we boated our one legal Bluefin that was 56 inches and weighed in at 87 pounds. We didn’t spend too much time jigging as we trolled most of the day hoping to catch a few Yellowfins to go along with our legal Bluefin. We also ran about 15 miles further offshore yesterday to fish the deeper water than on Friday’s trip where we had the great jig bite to increase our chances at Yellowfin. Our goal was not only boat a nice size Bluefin but find some of those 70 lb. Yellowfins that were caught the last few days mixed right in with the larger Bluefins. I expect to see more Yellowfins caught this week like in past years when we had both tuna species fishing further offshore on the 30 fathom lumps. This is why we ran the extra miles on yesterday’s trip even though we did not boat any Yellowfins we did have a few knockdowns on our short riggers and flat lines that we had out for Yellowfins. I think the excessive boat traffic had a lot to do with the troll bite yesterday but that is not new news when fishing on weekends and holidays. We marked tuna almost all day on the fish finder but they were mostly on the bottom, probably due to so much boat traffic and the amount of bait stacked up there. We did see and smell some awesome slicks especially in the early am and late in the day after the boat traffic thinned out, a few boats hooked up to large Bluefin only yards from us when we drifting and jigging. Towards the end of the day we decided to drop some jigs down but there was a very strong current and probably at least 15-20 knots of wind and it made jigging difficult especially in the deeper water. We did have one tuna grab a jig but it didn’t come tight unfortunately. We went back on troll and decided to fish an extra couple of hours hoping for an under Bluefin or some Yellowfins and marked tuna at least 5-6 miles from any of the popular 30 fathom lumps and hills so I do believe the tuna are now here off southern NJ, DE and MD in some very large numbers and if conditions do not change we should have some great inshore tuna fishing on both tuna species especially if you fish further offshore in the deeper water along the 30 fathom line. 87 Pound Bluefin Tuna caught on the Hooked Up II.